After a carefully scripted statement to reporters in Seoul, South Korea, about continuing discussions on the sensitive issues of European missile defense, President Obama and Russian President Dmitri Medvedev had a less formal chat about political realities. It seems pretty clear that President Obama's blunt statement about what he'll be able to accomplish during his second term versus his first wasn't meant for public consumption. But in an unscripted moment picked up by camera crews, the American president was more blunt: Let me get reelected first, he said, then I’ll have a better chance of making something happen. 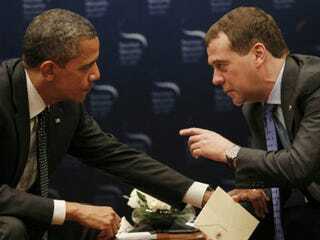 “On all these issues, but particularly missile defense, this, this can be solved but it’s important for him to give me space,” Obama can be heard telling Medvedev, apparently referring to incoming Russian president — and outgoing prime minister — Vladimir Putin. “This is my last election,” Obama interjects. “After my election I have more flexibility. The exchange was a rare glimpse of a world leader speaking frankly about the political realities he faces back at home. It could expose Obama, who was in Seoul for a nuclear security summit, to criticism that his international security agenda is being compromised by a reelection calculus.